Your best choice on Quality Health Care. We encourage you to visit our facility and talk to our staff about our Elderly Care Services. Life has its ways of providing serenity and comfort for everyone; fun and enjoyment; wellness and shelter. With a busy State like California, it is hard to find a place that can and will provide health care services that not only accept you as a client; but, also consider you as a friend. A peaceful and calming facility can make the difference for the lifestyle you have always wanted. We, at Family Affair Home Care, believe that everyone has the right and privilege to be treated with a high level of health care services without regard to race, color, nationality, religion or ethnic background. We are quite proud of the services that we provide to our clients. Our service are made possible through the expert training, education and experience associated with our Health Care Service Team. Our residential care facility offers 4 private rooms and one shared room. Located on a beautiful and quiet street in South San Francisco, our staff is caring and responsive to all of our resident’s needs. Our lovely facilities have cable T.V. and a telephone in each room. Our Special Care Services provides each individulal emotional and physical support. 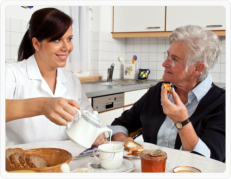 Specialized services such as Hospice Care and Dementia Care are also provided. Our In-Home Care Services offer flexible scheduling on a live-in or hourly basis and can be scheduled from 2 hours a day for up to 24 hours per day, 7 days a week. We are inviting you to find out more about our services. Please click here. You can also contact us today for a FREE ASSESSMENT to confirm your rate and care. We are proud to offer you with our variety of wonderful services that are suited for your needs.